Everything changes, it’s true, but in my world lately everything re-arranges. It’s been only a few months since much of the furniture in the house was turned over to The Departed, and I began the process of making the house – finally – my own. I thought I would just go slowly: Paint a couple of rooms that only I see, then slowly work my way up to bigger projects. I could never quite figure out how to arrange things anyway – nothing in this house ever seemed to look right. But the ideas start coming – quickly, and often, impulsively. I look at the large wall unit that houses my TV one day, and realize that if I get rid of that one thing, I can completely re-arrange the room in a way that makes sense and is much more cozy. I mention this to The Child, who proceeds to re-arrange all the furniture in that room after I go to sleep one night. And though I woke up the next morning and found myself completely disoriented – not to mention almost losing a cup of coffee tripping over an unexpected sofa – I also was sure I was on the right track. It feels much less like a house, and much more like a home. We give The Child’s outgrown trampoline to our new neighbors, who have two bouncy little boys. The new neighbors return the favor in the form of five rose bushes from their yard. We start having friendly visits, and chat about gardeners and handymen. It feels much less like the street we live on, and much more like a neighborhood. With all of the projects and re-arranging, everything is in chaos at the moment, and I frequently can’t find a kitchen counter or a clean dish when I need it. So, I find it’s easier to make a large vat of something that I can just heat up when I don’t have time to cook. One of my favorites is sloppy lentils, a recipe given to me by a vegetarian friend – whose child, unlike mine, will eat it – but originally from Fresh from the Vegetarian Slow Cooker . 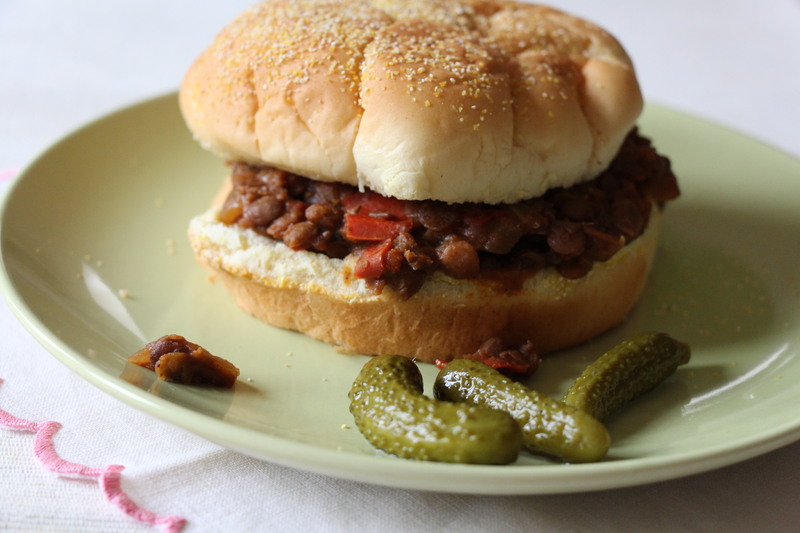 The recipe is basically Sloppy Joes, which I used to love as a child. I didn’t have a recipe, I had cans of Manwich and I loved every artery-clogging bit of it. Instead of meat, though, lentils are used, turning an unhealthy indulgence into a guilt-free nutritious meal that oddly enough, doesn’t feel like a poor substitute for the original. After several hours in the slow cooker, the lentils and sauce meld together into a savory, almost-meaty, warm and filling sandwich. I love to eat it on squishy hamburger buns, just like a regular sloppy joe. It makes enough to please a crowd, and also can be stored in the refrigerator and eaten slowly over a few days by just one person, as it reheats beautifully. Heat oil is skillet over medium heat. Add onions and peppers, cover and cook until softened, about 5 minutes. Add the chili powder, stirring to coat. Transfer onion mixture to a 3½ - 4 quart slow cooker. Add lentils, tomatoes, water, tamari, mustard, brown sugar, salt and pepper to taste and stir to combine. Cover and cook on low for 8 hours. The original recipe calls for cooking onions and peppers first in a pan, then adding it to the slow cooker. I just toss it all in. If there's a difference, I can't tell. Magnificent! I love these and am so glad you shared your recipe. I am going to try your recipe too and see what the differences are! Maybe The Child will like yours (I hope).